The CNRS (Centre Nationnal de la Recherche Scientifique) research fellows Mr Fakhry Abuzahra (ESR3), Mr Anirudh Asuri Mukundan (ESR 7) and Mr Aqeel Ahmet (ESR 10) were present at the annual event “fête de la science” in Rouen. 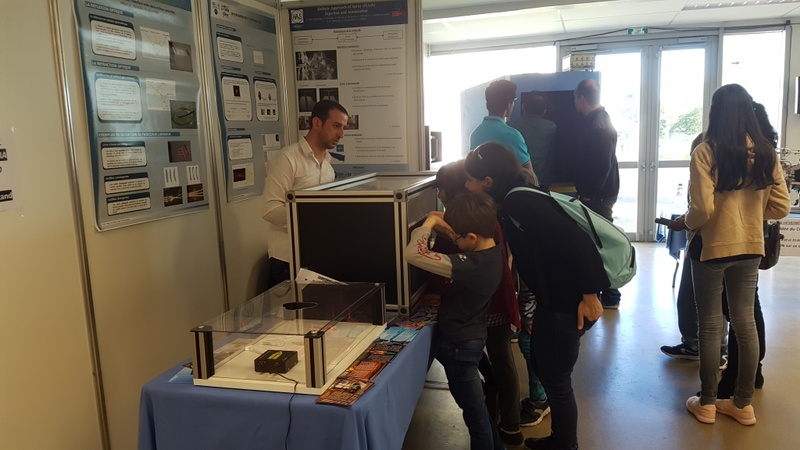 The “fête de la science” is a public event for students from schools and universities as well as for people living in the city of Rouen. The ESRs have shown some of the results from the simulations of the ARCHER code (an in-house code developed by the numerical spray group at CORIA lab) performed for numerical modelling of fuel spray atomisation. They also have promoted the Marie-Curie Actions Fellowships to university graduate and undergraduate students. Mr Abuzahra has prepared brochures, post cards and a poster to present his research topic to the general public. The post card idea motivated other ESRs to use similar material in their outreach activities, when addressing to school students. This entry was posted in Outreach by adminHaos. Bookmark the permalink. Copyright © 2019 HAoS ITN Project All Rights Reserved.